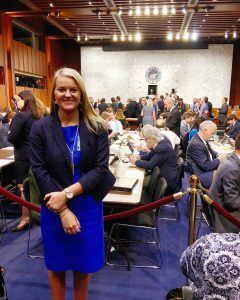 Haley Matthes ’19 couldn’t have imagined she’d have a front row seat to history when she showed up for her internship on Capitol Hill, never mind her mug in major media outlets. But that’s what happened when she attended the Senate intelligence committee hearing featuring James Comey on June 8. The former FBI director was testifying about his private meeting with President Donald Trump concerning Comey’s investigation of National Security Advisor Michael Flynn for allegedly facilitating Russian involvement in the 2016 presidential election. Sitting just a few rows behind Comey, Matthes wasn’t the only Pard in the room. A few seats down were Frank Clarke ’19 and Michael Schmidt ’05. 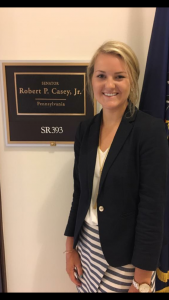 Clarke, like Matthes, was interning with Sen. Bob Casey of Pennsylvania, having emerged from a pack of hundreds of applicants. Schmidt was covering the hearing for the New York Times, where he’s broken major stories on Major League Baseball’s doping scandal, the use of a private email server by Hillary Clinton when she was U.S. secretary of state, and alleged contact by Trump’s campaign aides with Russian intelligence officers. Matthes provided some insight and reflected on the gravity of it all. How did the opportunity arise to get into the Comey hearings? What was the process like getting into the room? I couldn’t sleep a wink the night before; I was too excited. I remember thinking that this was a once-in-a-lifetime opportunity and that if I didn’t at least try to get in the room, I’d always regret it. I woke up at 4 a.m., got ready for work, and then went in, only to realize that there were all different, massive lines at different entrances. After I and another intern realized that the actual entrance was around the corner from the line we were in, we sprinted in and through security and somehow secured a spot somewhat close to the front of the line. Keep in mind, this was all around 6 in the morning, and the hearing room didn’t open until 9:30. I was also wearing heels, something I quickly regretted, as we stood for the next three and a half hours, constantly listening to Capitol Police count and recount who was going to be able to get a seat in the room. Standing in line was actually more fun than it sounds though. I got to meet a lot of interns from many different offices, and we quickly bonded over the chance to be a part of this. What was it like to be in the room? When we got to the front of the line, it was absolutely insane with the amount of news crews outside the door. We were afraid that after all this time waiting, there weren’t going to be enough seats. Finally, the police officer escorted me and three other interns inside, and then they closed the doors. To be the last members of the public allowed in the room was insane. We walked through a hallway and into the actual hearing room, and I looked around in disbelief at the absolute circus that the room was. There were dozens of reporters and staffers, and everyone was rushing around trying to find their seat. I knew that over 600 people had stood in line that morning, and over 20 million Americans were going to be watching this, so being in the room where it happened is probably a moment I’m going to remember for the rest of my life. People keep saying that this was the biggest thing to hit D.C. since the Watergate scandal, and it was incredibly humbling to be present for this moment in history. Describe a little about what you do for your internship with Senator Casey. I do a variety of things in my internship, ranging from my administrative duties, like sorting voicemails and mail, to my “cluster” work, which is where the other interns and I split into our cluster groups, or general areas within the senator’s legislative sectors. I’m the only intern in the National Security and Foreign Relations cluster, which is awesome to me because I’m incredibly passionate about foreign relations and intelligence matters. My duties for my cluster bosses include attending hearings and writing reports on them, drafting letters to various constituents and focus groups, and updating the senator’s position pieces in response to current events. What kind of skills are you bringing back to Lafayette from your internship? It really still hasn’t hit me how fortunate I am to have gotten this internship, and I truly feel that I’m actually doing real work that is making a difference. I am learning so much more about areas like foreign policy and counterterrorism than I ever thought possible, and being able to go to hearings and listen to people I have only ever watched on television is awe inspiring. You have to understand that I’m a bit of a nerd when it comes to politics, so when I see a senator in the halls it’s like I’m seeing a celebrity. I feel that my experience in Senator Casey’s office has made me more aware of the moment we are living in in history, and it has helped to mold me into a more cognizant global citizen. Oh, and if anyone ever needs a tour of the Capitol building, I’m certified! Any reactions to the iconic picture you’re in? I’m just upset they wouldn’t let me bring in my “Hi Mom” sign.